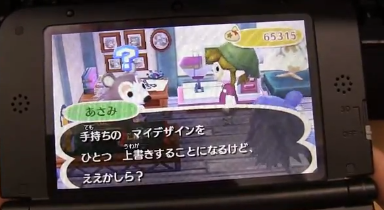 Animal Crossing New Leaf is a game for 3DS, and during the play, if you keep on contacting Able Sisters, you will become able to design your own cloth, hat, flag, etc, and also enables sharing with your friends by using QR code. I have created Android app for reading / writing this QR code, with design tool so you can design using your android device. 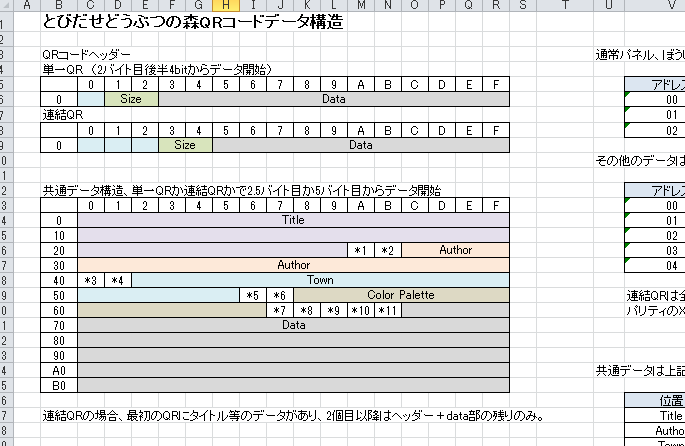 I will leave data structure for QR code I’ve analyzed during development, for somebody who might want. Below is movie for my app for reference. Data is encoded to QR code in binary format, with multiple QRs for some designs, which is a rare type of QR code usage. Download excel file below if you are interested. (June 15, 2013) Fixed and added color index info. (June 17, 2013) Modified unique ID info. (June 18, 2013) Modified unique ID info (*12 – *15). English translation is in Sheet 2. Several of those are out of range of the 159 long list of colors, and only color 5 (0 based index) is correct. Any tips? Sorry, color info was incorrect. 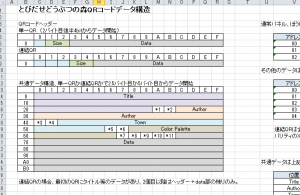 I’ve updated color info in excel. Thanks for those comments. I have it working for both reading and writing (you can see the generated QR codes here: http://animalxing.com/patternsv3/textures.php). Still working on updating the creation part to allow custom palettes. Any chance you’d open-source that PHP code? Really wish someone would make a program for computers using this. Too poor to actually own any smart phone right now. I sort of did, it’s located here but not as fully featured as NeFa’s app.